Looking for a fabulous drink to enjoy during your Game of Thrones binge watching? We would suggest the delightful Gillie Fix. Not only does it tie into one of the show's characters — Gilly played by Hannah Murray — but it also has a certain "fire and ice" aspect that is a ton of fun. The Gillie Fix is interesting because it brings a fantastic Scotch whisky into a slightly tropical drink. 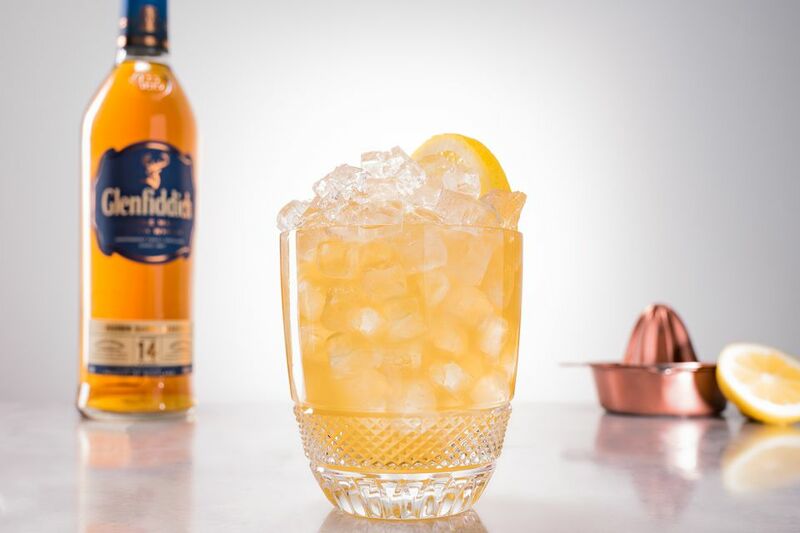 Typically, we would reserve something like this bottle of Glenfiddich for a Rob Roy or straight sipping, but it really does work in a fruity recipe with a little rum and brandy. When you're ready to bring scotch into your summer drink repertoire, you'll find few recipes that are as pleasing and surprising as this one. Give it a try, you have little to lose. Strain into a double old-fashioned glass filled with crushed ice. Garnish with a lemon wheel between the glass and ice. The recipe was originally written with parts and you can certainly take that approach and adjust the volume if you like. However, a common pour is also provided in the ingredient list to give you a good starting point. By using the ounce measurements given, you should have about a 5-ounce cocktail once it's all mixed up. The Scotch. Glenfiddich offers a wide variety of whiskies and the 14-Year-Old recommended in the Gillie Fix is one of the core expressions. This single malt scotch is aged 14 years. The Bourbon Barrel Reserve is a U.S. exclusive release that is aged in former bourbon barrels. It's one of the more affordable Glenfiddich bottlings, running just under $50 on average. If you cannot find this particular Glenfiddich, try out one of the brand's other offerings. The 12-Year-Old is the youngest of the portfolio and would also make an excellent Gillie Fix. The Peach Brandy. Fruit-flavored brandies, including peach, are making a big comeback after years of decline. There are a number of great options available today, particularly if you look to the small craft distilleries. For the best peach brandy, choose one that does not include extra sugars or additives. Cheap "brandies" which are more liqueur than brandy have been the norm on liquor store shelves for a few decades. They're syrupy, low-proof, and, quite honestly, not your best option for any drink. Read the labels of peach brandy very carefully. You can also look for peach whiskey or try your hand at infusing brandy with fresh peaches. The Rum. Flor de Cana produces some nice rums in Nicaragua. There are a few 7-year-old options available, including Blanco Reserva, Gran Reserva, and Gran Reserva 90 proof. Any of these would be an excellent addition to your bar because they're all great for cocktails. How Strong Is the Gillie Fix? Three distilled spirits go into the Gillie Fix and this does ramp up the alcohol content. If you were to use the recommended brands and measurements, you can expect this cocktail to be around 20 percent ABV (40 proof). It's neither the lightest nor the strongest cocktail in the bar, yet it's good to take it easy with this one. How Will You Name Your New Drink?